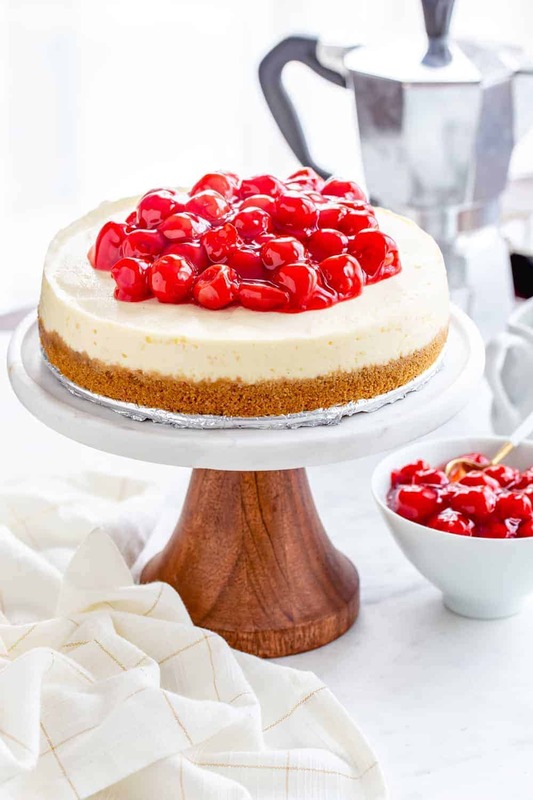 Instant Pot Cheesecake couldn’t be easier or more delicious. Serve it up with pie filling, fresh fruit, or chocolate ganache for the perfect dessert. This recipe is sponsored by Challenge Dairy, but all thoughts are my own. Thank you for continuing to support the brands that make My Baking Addiction possible. Guys, it’s been a little while, but I am back from what felt like months of travel. If you follow me over on Instagram Stories, you know that I was in Detroit for work, then headed to Florida for a couple of weeks for vacation, and then a quick work trip to Utah. I don’t know about you, but travel seriously takes a lot out of me. First of all, flying freaks me out – especially when I am by myself and even more so if I’m wedged in between two strangers for hours. I’ve always been an aisle girl, but sometimes I procrastinate booking flights, and end up as the center of a passenger sandwich, which is literally my version of a nightmare. Especially if said passengers try to talk to me for 4 hours straight even if I’m clearly binge watching (with headphones in mind you) season 4 of Roseanne. I also never sleep well when I am out of town on work trips. One day I’m going to wise up and start calling hotels ahead of time to reserve a box fan. Yep, I’m one of those people that requires noise to sleep. And unfortunately, white noise apps, sound machines, or the TV just won’t cut it. I blame all of this on Eric because he’s basically turned our bedroom into a noisy wind tunnel and I just can’t sleep in silence. He’s even passed this little sleeping quirk onto Elle who happens to have her very own perfectly positioned in her bedroom. Now I’m back in Ohio waiting for the weather to get over 65 degrees (seriously, Ohio weather is the worst) and baking up some pretty delicious desserts. If you’ve been a reader of My Baking Addiction for a bit, you are probably well aware of my love of cheesecake. From Rosé Cheesecake and Sweet Potato Cheesecake to Cheesecake Brownies, I simply can’t get enough of this smooth, creamy dessert. Not only do I love eating cheesecake, it just so happens to be one of my favorite desserts to make. Ever since I posted my Instant Pot Oreo Cheesecake, making cheesecake in my electric pressure cooker has been one of my favorite methods for perfect cheesecakes. 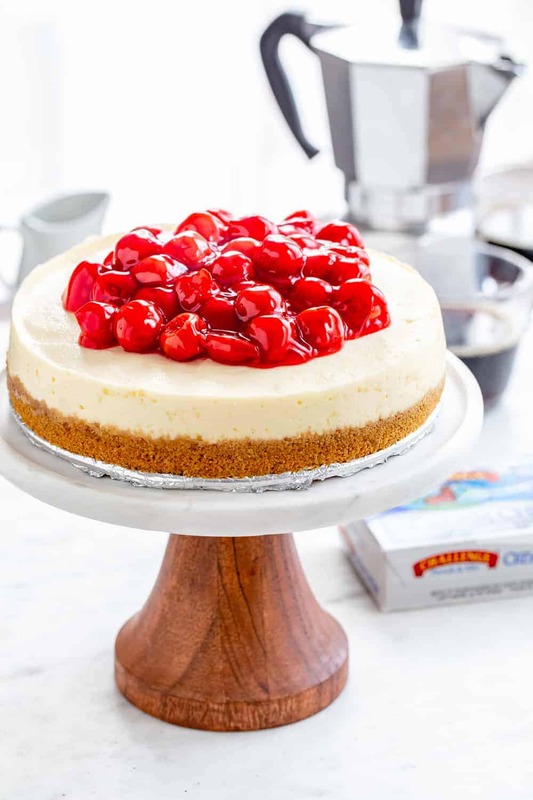 That method coupled with Challenge Dairy cream cheese is my recipe for cheesecake perfection! 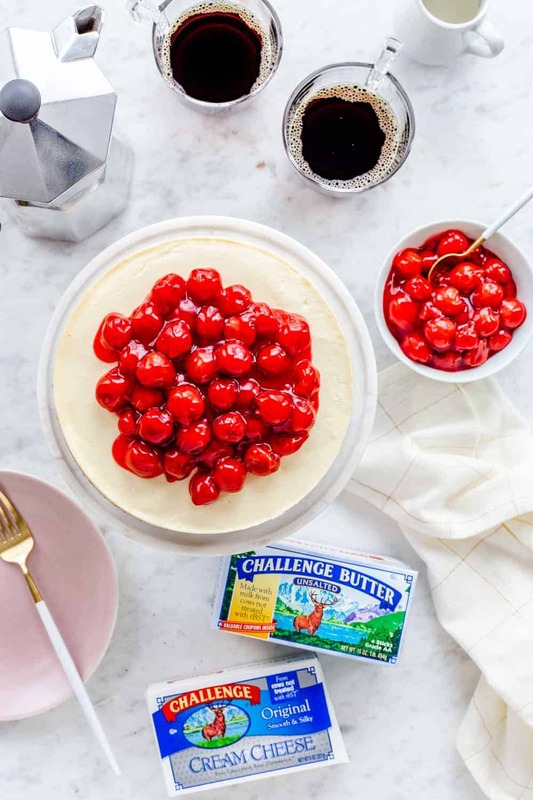 I’ve been partnering with Challenge Dairy for years because I am such a huge fan of their products – everything from their butter to their cream cheese spreads are simply incredible. Did you know that they are the only dairy product company that controls the whole process from milking the cows, to transporting milk, to packaging the product? Pretty awesome, right? 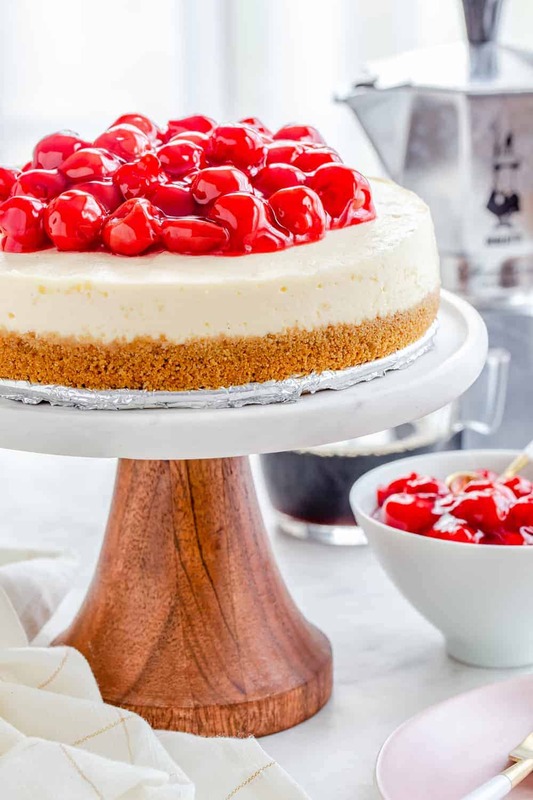 If you have an Instant Pot, you simply have to add Instant Pot Cheesecake to you must-make list. I promise, the ease of prep and the lovely texture will seriously wow you! Just take my advice and be sure to pick up an extra sealing ring to use for sweets, or your gorgeous Instant Pot Cheesecake might end up smelling like pulled pork. Which is never a good thing. Turns out the Instant Pot sealing ring holds odors like a magnet. An unfortunate fact I might have realized, had I actually read the instruction booklet. Lesson learned though, I know own several color coded sealing rings, so pulled pork Instant Pot cheesecake is a thing of the past. Aside from an extra sealing ring, you’ll also need a 7-inch springform pan, which you can find on Amazon for a reasonable price. A 7-inch pan happens to be the perfect size for a small cheesecake for two – with a couple slices for leftovers, of course! 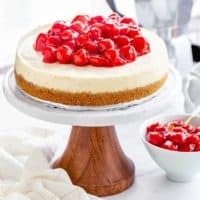 Making an Instant Pot Cheesecake is just like making a regular cheesecake until you get to the cooking part. And to be honest, I think Instant Pot Cheesecake is actually easier because you don’t have to mess with a water bath because the Instant Pot creates a water bath for you. You’ll also need a to create a “foil sling” by folding along piece of foil in half lengthwise two times. This “sling” is a trick I learned from my friend, Barbara, and it will allow you place and remove the springform pan with ease. 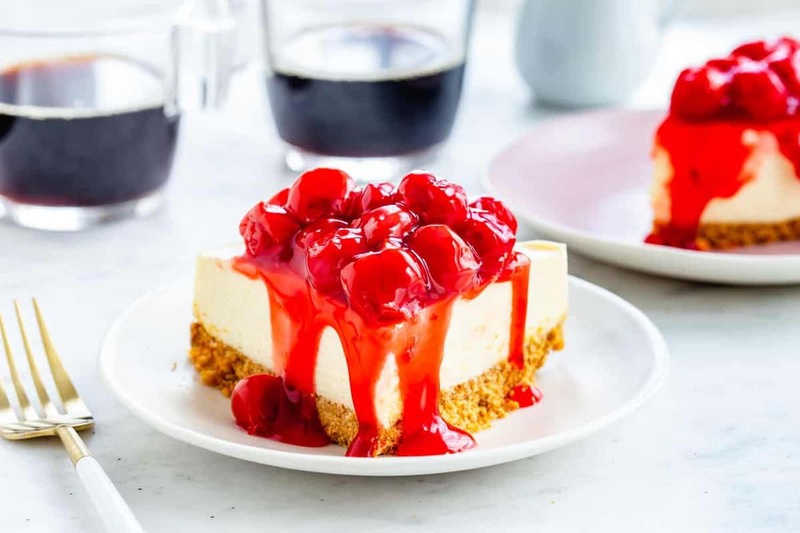 This Instant Pot Cheesecake cooks for 35 minutes on the manual setting and will require a 10-minute natural pressure release, followed by a quick release to remove any additional pressure. 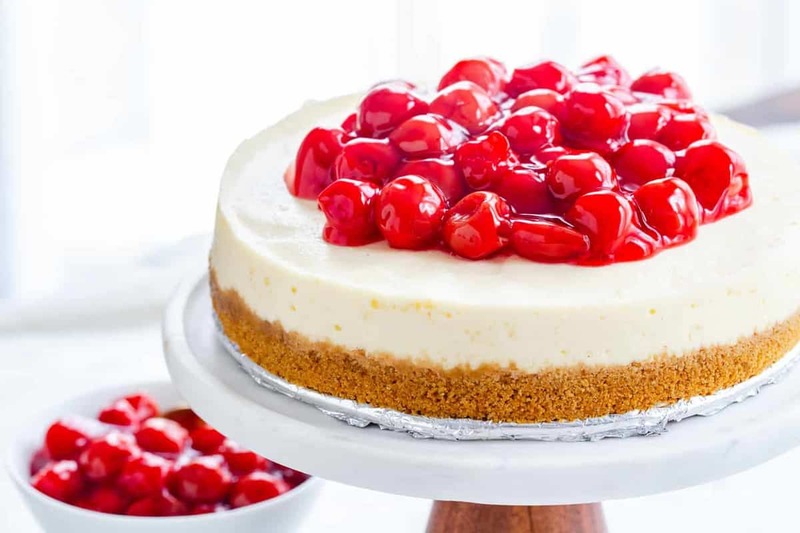 Once you remove your cheesecake from the Instant Pot, you’ll cool it to room temp for a bit and then refrigerate it for at least 8 hours. 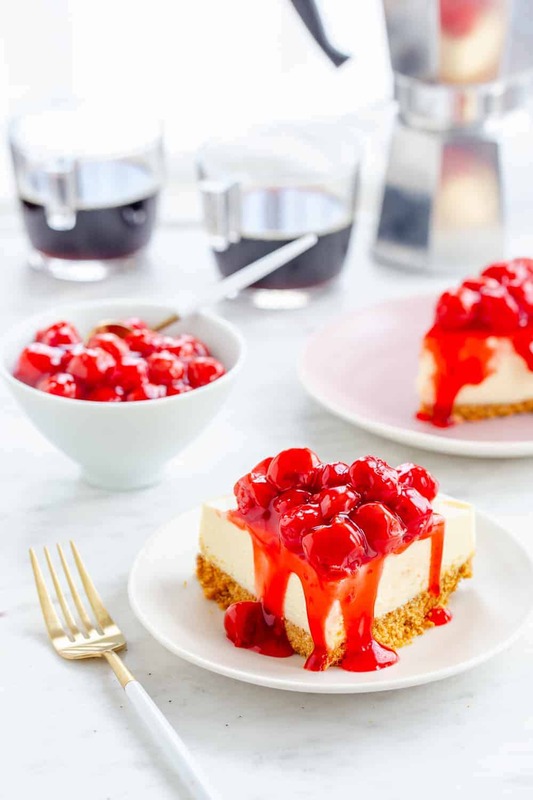 Whether you’re test driving desserts in your Instant Pot for the first time, or whipping up a sweet treat for the weekend, I hope you enjoy this Instant Pot Cheesecake as much we do! For more delicious cheesecake inspired recipes, be sure to check out this Strawberry Cheesecake Fluff, No-Bake Pineapple Cheesecakes and these Mini Nutella Cheesecakes. In a small mixing bowl, stir together the graham cracker crumbs, sugar, and melted butter. Press the crumbs into the bottom of the prepared pan. In the bowl of your stand mixer fitted with the paddle attachment, or in a large bowl with an electric mixer, beat the cream cheese until smooth. Add sugar and mix until combined. Add eggs, one at a time, fully incorporating each before adding the next. Making sure to scrape down the bowl in between each egg. Add in the flour, heavy cream, and vanilla and mix until smooth. Pour batter into prepared pan. Carefully unfold the foil sling and remove the cheesecake from the pot to a cooling rack using the foil sling “handles”. Before serving, top with pie filling and whipped cream if desired. WOW this cheesecake is stunning! I’m selfishly glad you’re back here in Ohio and have returned with a fabulous recipe! Though I do hope you’re able to relax more soon and don’t have to deal with travel woes for a while. Thanks so much, Liz! I hope the weather has brightened up in your neck of the woods! Thanks so much for stopping by and taking the time to leave a comment! I am the same when comes to traveling, except for I’ve never had to fly. 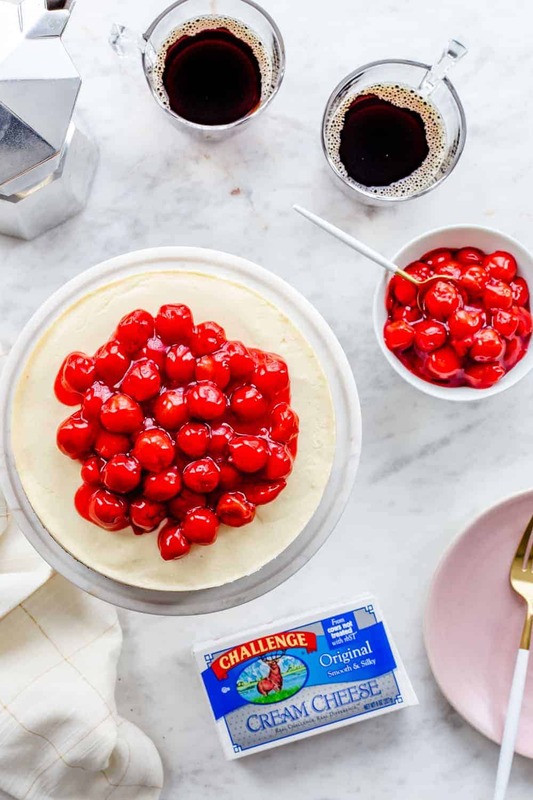 I look forward to trying this cheesecake for my weekend baking project and of course I will be using Challenge cream cheese. Thanks for the great recipe. Thanks so much for stopping by, Milisa! I hope you love the cheesecake as much as we do! There is a video! It’s at the top of this post right under the title of the recipe. I hope this helps. This cheesecake is just what I have been looking for. 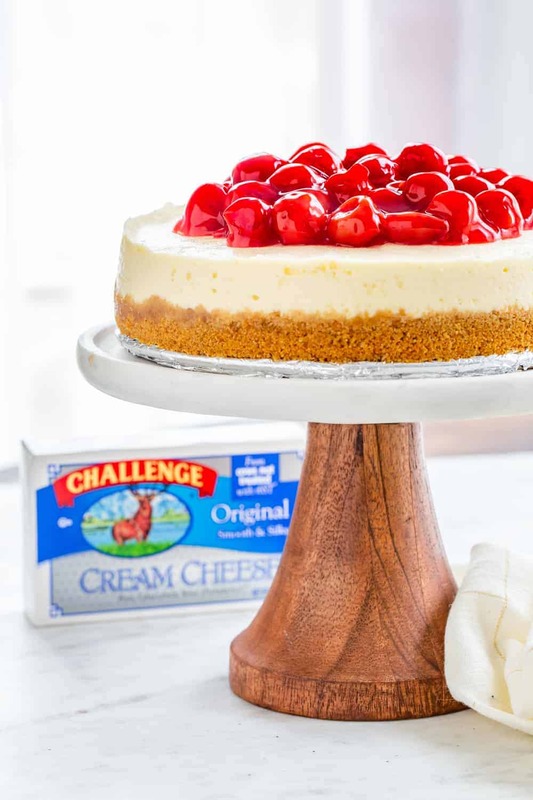 I have been using Challenge Dairy butter for years and I look forward to trying the cream cheese for this cheesecake. I hope you love it as much as we do! Challenge Dairy is so darn great! Thanks so much for stopping by! 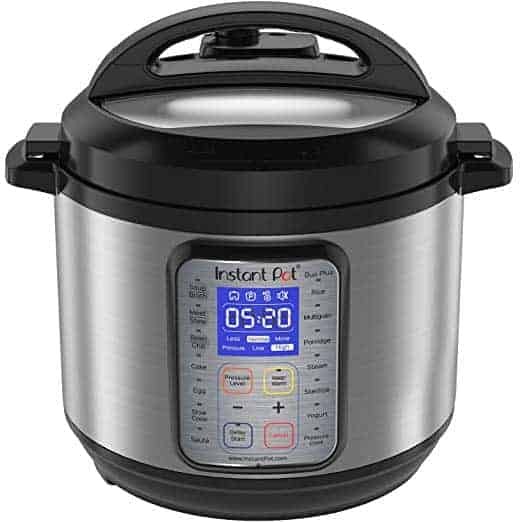 Is a instant pot different than a pressure cooker? Hello! An Instant Pot is an electric pressure cooker. I hope this helps! First time trying to make cheesecake in the IP. It turned out really delicious (despite the fact that I had only used 1 block of cream cheese – Philly brand). I’m from Canada where everything is metric and I just didn’t realize that 160z is the equivalent of 2 blocks of cream cheese (duh!). The cheese cake was not as high (obviously) but it still tasted like real cheesecake baked in the oven. Given all the news about global warming and hotter temperatures for the next 5 years; the IP is the way to go! It doesn’t heat up my kitchen. Thanks for the clear instructions and video. Thanks so much for stopping by, Linda! I’m so glad to hear you enjoyed the cheesecake. My wife’s instant pot has this nifty insert that has handles on it. I dont know what its called but it makes lifting out the cheese cake a snap! Thank you for the recipes and the witty story to along with! Thanks so much for stopping by, Marc! I appreciate you taking the time to comment. Happy Baking! Hello! I haven’t attempted this recipe as a half recipe, so I am not sure of the result. If you happen to give it a try, I’d love to know how they turned out. Thanks so much for stopping by. HI , I made this last night and it is delicious! It seems a little mushy in the middle, do I ” bake” it a little longer? Also, I used fresh eggs from my chickens and one of the eggs had 2 yokes in it, so I used 3 yokes, could that be it? And do I cover it in the fridge? Thank you! I made this cheesecake twice this weekend because it was so delicious! So happy to hear you enjoyed the cheesecake! Thanks so much for stopping by and leaving your feedback! Thank you for this recipe. I can’t wait to try it. But, if my cheesecake pan has a handle do I need to use the trivet? 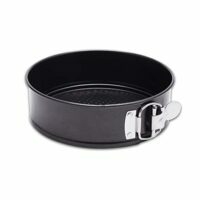 Hi Diane – I would still use the trivet; you don’t want the pan touching the bottom of the pot. Hope this helps! Happy baking. Would really like to try this cheesecake recipe. Can it be used with other brands of digital pressure cookers? I have a Bella and it not come with the trivet mentioned in your recipe. Hi DJ – You should be able to use this recipe with any electric pressure cooker. You can purchase trivets on Amazon fairly inexpensively – I’d search on there for an electric pressure cooker trivet for your size device. Hope this helps! Definitely i will this cake this weekend…yummy thank you for sharing delicious cake recipe Jamie. Thank you so much for this recipe, Jamie! I made this cheesecake yesterday and it turned out delicious! My kids loved it and they say thank you! So happy to hear you enjoyed the cheesecake, Michael! Thanks so much for stopping by and leaving your feedback! Finally a recipe that comes out as promised. So good. Can’t wait to make again. Thanks so much for stopping by, Kim! I appreciate you taking the time to comment. Happy Baking! Great recipe! However we had to increase Cook time to 45 minutes as it was not cooked all the way through….2 tries in a row. So happy to hear you enjoyed the cheesecake, Gina! Thanks so much for stopping by and leaving your feedback! 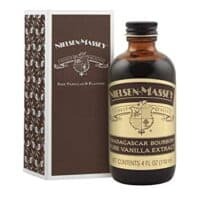 Do you think you could substitute Bailey’s for the cream? 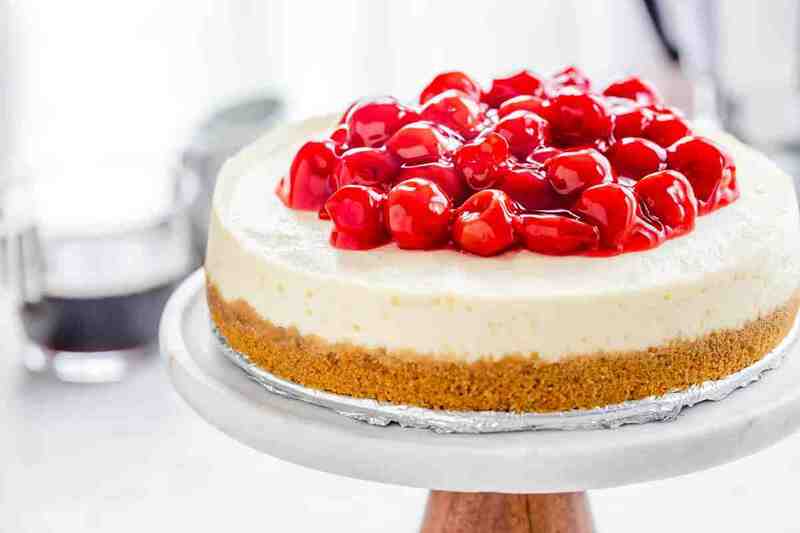 Hello – I haven’t tried this exact cheesecake recipe with that substitution, but I have used Baileys before in cheesecake (https://www.mybakingaddiction.com/baileys-irish-cream-cheesecake/) and it turned out great, so you could definitely try it here. If you do try it, I’d love to hear how it turns out! Happy baking. Hi Jamie, really loved the cheesecake. At what point do you unmold it? After it’s cooled on the counter or after the hours in the fridge? I added cocoa powder to the crust and a little Kahlua to the cheesecake with a dusting of cinnamon and cocoa powder to the top to give it a tiramisu vibe…yum! 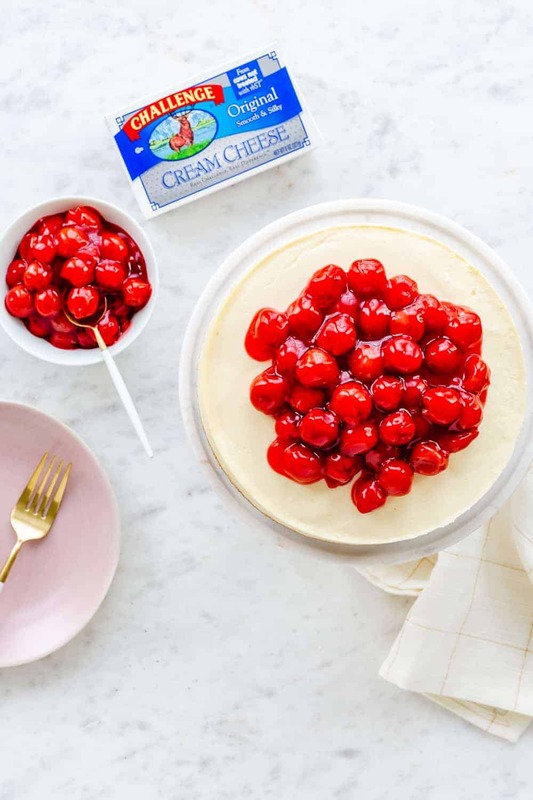 Hello – You’ll want to wait to unmold the cheesecake after it has chilled in the fridge. I usually wait until just before serving (or arranging on my cake plate). Hope this helps! Happy baking. This looks great!! Just had an instapot “party” with 5 gals, 1 of whom uses her instapot 3-4 times a week. We all needed a tutorial so she was our gal. I was the one with the small 6 quart pot and we all made a different recipe. I want to make a cheesecake using a 6 inch springform pan (I bought a silicone one with glass bottom – awesome for my Instapot lasagna!). How can I convert this recipe for a 6 inch springform pan? Hello! I haven’t attempted this recipe with a 6-inch pan, so I am not sure of the result. If you happen to give it a try, I’d love to know how it turned out. Thanks so much for stopping by. CN I use sour cream instead of heavy cream? Can I use sour cream instead of heavy cream.? Hello! I haven’t attempted this recipe with this substitution, so I am not sure of the result, but I don’t think the texture and flavor will be right. If you happen to give it a try, I’d love to know how it turned out. Thanks so much for stopping by. Great recipe! Made it for the first time and it was a hit! So happy to hear you enjoyed the cheesecake, Jeannette! Thanks so much for stopping by and leaving your feedback! Can you use neufchatel vs cream cheese? Skip the flour in the recipe, and add five minutes to the pressure cooking time for a creamier, softer texture. Also, make sure the cream cheese and eggs are at room temperature before making the recipe, otherwise it could result in a grainy texture. I made the entire recipe in my food processor and had perfect results. I used vanilla wafers for the crust. It was a wonderful dessert! So happy to hear you enjoyed the cheesecake, Garry! Thanks so much for stopping by and leaving your feedback!